The history of the Alfred Box of Books Library began in 1853 when the original Box of Books building was constructed and was located on Main Street in Alfred, where “Hair Care” stands today. In 1856, Thomas H. Ellis ran a saddle, harness and trunk shop from the building. In September of 1864, Ellis made room in the front corner of his shop for A.A. Shaw to open a watch repair and jewelry store. It is said that the jewelry store consisted of approximately half a dozen silver spoons. When the shop was no longer home to saddles, clocks and spoons, it became a law office for Charles Stillman while he served on the County Board of Supervisors and an insurance office for D.S. Burdick. In 1912, the building was moved just around the corner to a tiny lot on West University Street. There George F. Stillman who “mended everything,” including locks, bicycles, and shoes, occupied the establishment for a while. There was even a period when it was a poolroom of sorts. In 1923, Norah Binns bought the building from its owner, Mr. Rosenbush, for $75 and opened the Box of Books as a bookstore on July 2, 1923. At the time of her marriage to A.D. Frazier four years later (1927) she sold the Box of Books to Hazel Humphreys, a 1919 graduate of Alfred University. On August 31, 1949 the building was moved to its present site onto land leased to her by Alfred University. 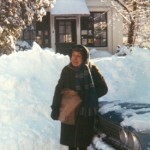 Humphreys operated her beloved bookstore into the 1970’s and she was an iconic figure who cared deeply about the value of books. Her love of dogs was legendary as well. Upon her death on May 31, 1978 at the age of 81 she bequeathed the Box of Books to Alfred University. (Hazel Humphreys in front of Box of Books at its final location). The Town and Village of Alfred did not have its own public library during these early years. Alfred University’s Carnegie Hall housed the University Library collection and the public was permitted to borrow materials. From 1967 until August 1, 1976, the Southern Tier Library System provided bookmobile service to the community. However, when the bookmobile suffered an irreparable accident, the service had to be discontinued. 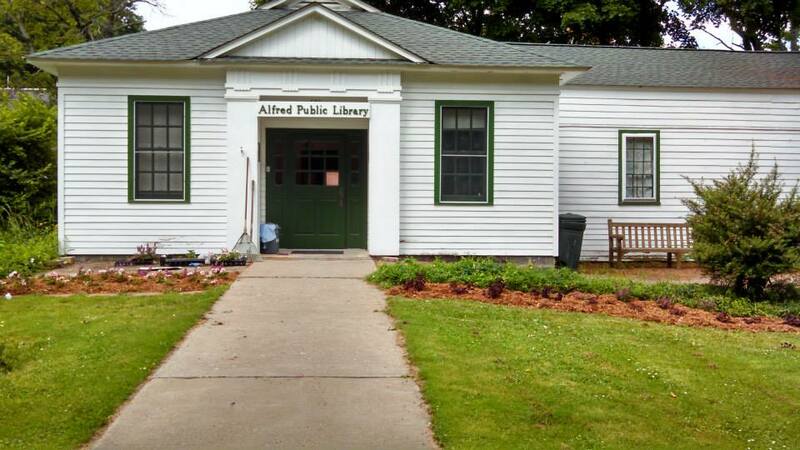 The need for continued library service was acknowledged by the Village and Town and arrangements were made with the Southern Tier Library System and Alfred University to set up a reading center to be located in Greene Hall on Main Street. The Alfred Reading Center operated from that location until the fall of 1984, when it moved to its current location and was renamed the Box of Books Reading Center. 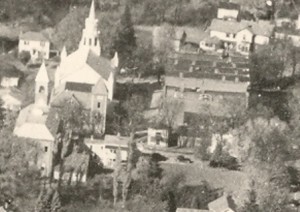 In 1985 the Village of Alfred gave $20,000 toward an addition to the original building. Thanks to community fundraising efforts, the donation of time and labor on the part of Alfred State College’s Building Trades students, and numerous volunteers, the addition was opened on April 21, 1988. The Reading Center had always operated on a sparse budget and any hope of becoming an official public library within the New York State System was dependent on increasing the collection, hours of operation and services provided to the community. A first attempt to garner taxpayer funding in 1997 ($12,000 to be divided equally between the Alfred and Almond libraries) was turned down by voters. A second attempt on May 21, 2002 was successful ($40,000 tax levy to be divided equally between the Alfred and Almond Libraries) as was a subsequent levy of $30,000 on May 16, 2006. The Library was granted a Provisional Charter by the Board of Regents in 2003 and received its Absolute Charter as Public Library on March 17, 2009. In 2010 the Box of Books was awarded a significant grant to become one of 30 Public Computing Centers in New York State. Known as ePLACE, the Alfred Box of Books Library’s Public Computing Center (PCC) was funded through the New York State Library Broadband Technology Opportunity Program (BTOP) Grant with federal funds from the American Recovery and Reinvestment Act (ARRA). The purpose of the grant was to expand computer access, availability and training to underserved areas. The grant supports the purchase of computers, e-readers, videoconferencing equipment as well as expanded hours, access to free training, and expanded wi-fi. The library continues to enjoy the active support of community members, Friends of the Library, volunteers, and local organizations. Between 2009 and 2015, taxpayers have shown their support for the Box of Books by voting to increase funding to help offset budget cuts for library services.